He was a good and tolerant cat. After more than 10 years together, I can’t take it anymore. I toss and turn all night, I wake up cranky and unrested — I’m not sleeping at all and it is because of sharing a bed. There’s the snoring, the space hogging, the need to be touching me the entire night. And that doesn’t even take into consideration the times he throws up on the duvet cover. I’m talking, of course, about my cat, Seamus. I realize this is my fault because I let him sleep in our bed. But to my credit, I assumed the arrangement was going to be temporary, something we allowed while he worked through his grief. You see, Seamus used to sleep in the laundry room with our other cat, Brooke. They had a fairly elaborate set-up down there, with their food and water, litter boxes, kitty condo and assorted catnip toys. At the end of an arduous day of sleeping, eating and lazing around the house, they’d happily trot down there at bed time when we called them, we’d close the door, head upstairs, and everyone in the entire house would sleep peacefully. But when Brooke died last year after they lived together for more than eight years, he sank into a depression. Before you roll your eyes and think I am one of those crazy cat people who thinks felines mourn and understand these things, let me just tell you that during my weekly kitty tea party (this week’s theme: Harry Potter! ), my four-legged guests Hairy Potter, Purrmione Granger and Alpuss Dumbledore assured me they do. While he was grieving, Seamus also had no appetite. He was listless (no list at all) and melancholy and he lost so much weight that for the first time since he came to live with us, I could actually pick him up without risking a hernia. It was obvious it was just too painful for Seamus to spend the night in the laundry room alone so I began allowing him to sleep in our bed. When I realized just how much this was interrupting my sleep, we went so far as to adopt another cat to try and get them back in the laundry room sleeping routine. Alas, our new cat does not like being in a closed room and expresses that very vocally, so we now sometimes share our bed with two cats. I’m exhausted and I have no idea what to do. Perhaps I’ll ask Paul McCatney at next week’s Beatles-themed tea party. Me: "So, what did you guys think?" Mr. Brutalism: "Man, the Seven of Hearts was really packing some heat." Me: "Oh My God. I could not take my eyes off him! Do you think that was a codpiece? That must have been a codpiece." 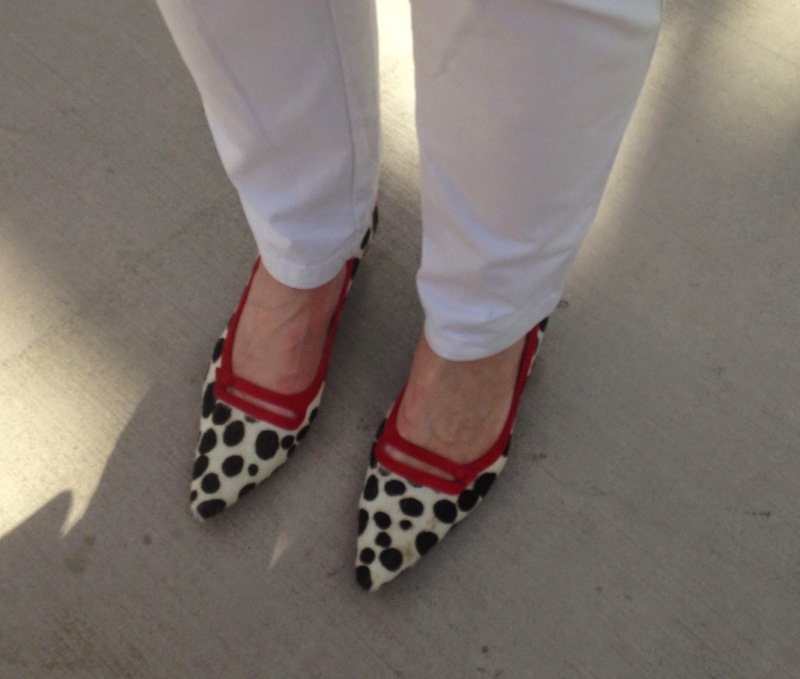 You know how you sometimes find yourself wearing Dalmatian shoes and announcing a dog fashion show in front of several thousand people? Don't worry, they're faux. As far as you knaux, anyway. 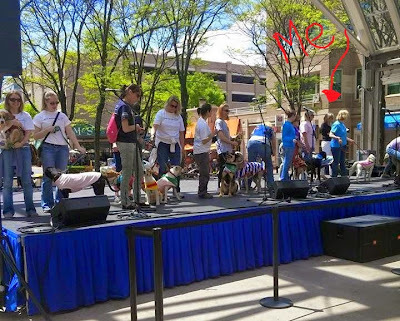 I had one of those moments on Saturday at the annual Reston Pet Fiesta. 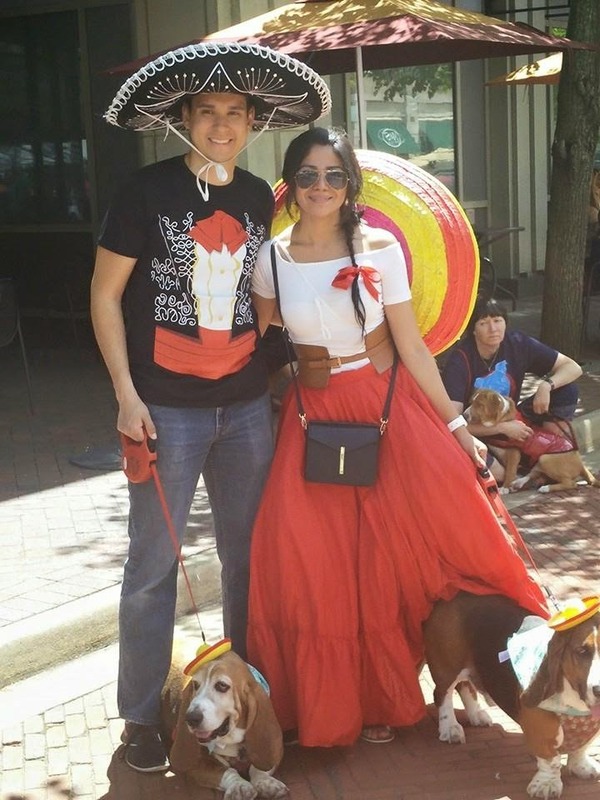 On Friday afternoon, a friend of mine who works with the Good Dogz organization e-mailed to say the radio station personality scheduled to announce the dog fashion show at the Fiesta had cancelled, so could I step in and do it? (Apparently, Left Shark was busy.) And if I know anything, it's that when you agree to help out at the last minute when people are desperate and expectations are very low, they are very grateful no matter what your performance. It is in this type of environment that I really thrive. Of course I posted this opportunity on social media the nano-second it was finalized and that's when my neighbor, Lisa, and I began texting dog/fashion puns back and forth to use in my schtick. However, when I got to Reston, I learned that my script was already written and I would not be able to use any of this fantastic material. Because I hate for this brilliance to go to waste, please enjoy the following: Devil wears Paw-da, Dolce and Gabone-a, Vera Wag, Fur-sace, Cynthia Growley, Helmutt Lang, Flea St. Laurent, Lily Pul-leasher, Bark Jacobs, Kate Spayed, Ruff Lauren, Jimmy Chew, Cindy Pawford and "please remember to spay and neuter your models." Perhaps it is better the script was provided. I was obviously a very integral part of this event. In one of the dog's bios it mentioned that he was still working on potty training. 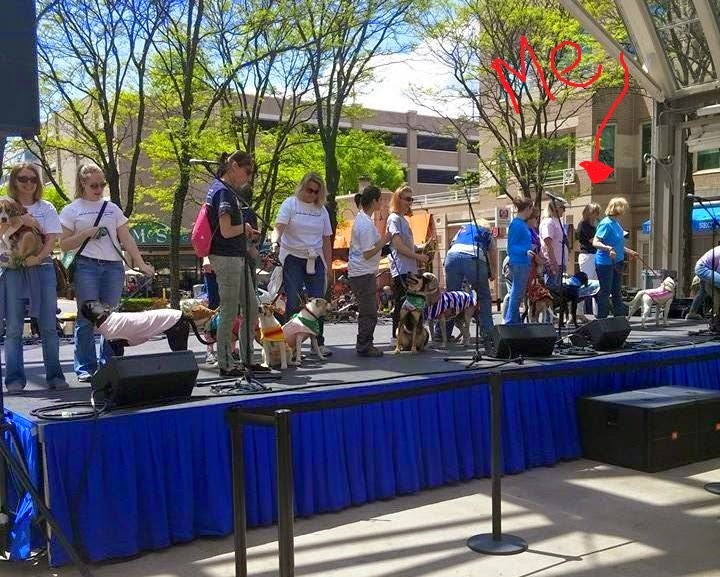 And I said, "you and me both, brother"
Team Canedo came out to support me and enjoy the event, which boasts several thousand attendees and more than 40 rescue groups. It was a gorgeous day and we loved every minute of it and met a lot of great dogs that need forever homes. This is Bear. 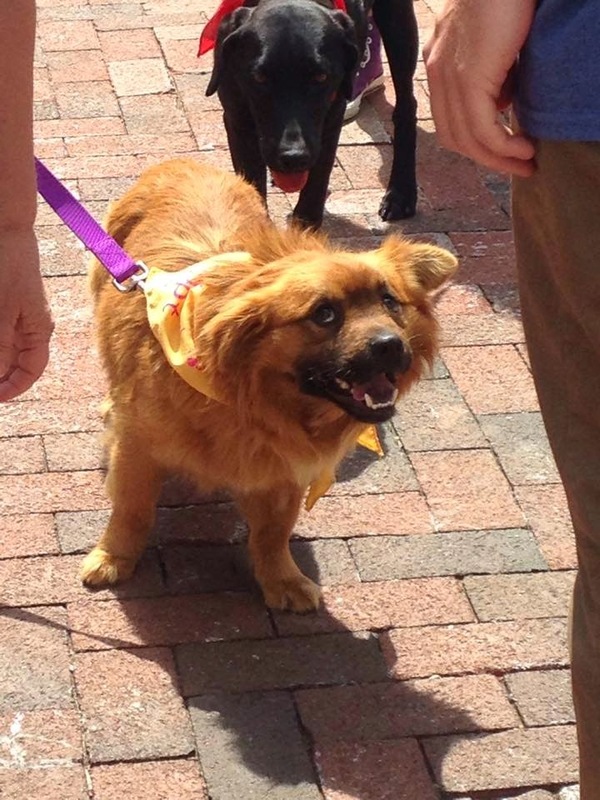 He is a Golden Retriever/Corgi mix. And I love him. And an aside: I also have gold shoes, so if there is ever a last-minute need for me to substitute as Oscars host...I'm in. I'm back from a great weekend in Richmond with three college friends I met during a semester abroad my junior year. It was not an immediate friendship as we experienced an initial drama kids/sorority girls divide that could have rivaled the Jets and Sharks in its intensity. But then we realized they would totally kick our asses in a choreographed musical rumble and figured it was easier to just be friends. And even though we planned this weekend about eight months ago before I knew I would be done with drinking altogether (what? who are you? 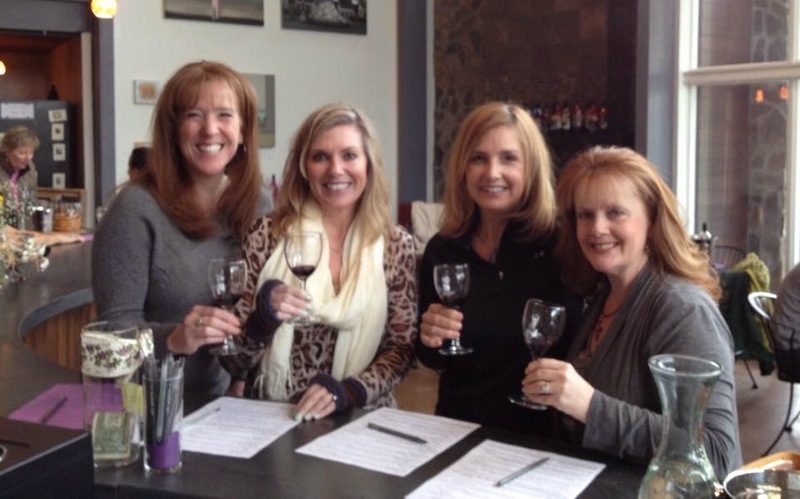 ), I had a fantastic time on our wine weekend touring vineyards and hanging out with these ladies. Look at me. Pretending to sample wine. Like a big girl. The "Sh-Sh....Shhhhh" move (depicted above) is so unbelievably condescending and stupid, yet it is also never not funny when used during conversation. This became our signature move of the weekend...and subsequently during my annual review at work, at parent/teacher meetings and while receiving communion. Carrie has never dated a man who uses a nickname. In her long, storied dating and marital history there have been two Jameses, a David, a Patrick, a Rodney and a Michael. Which frankly, is a terrific screening tool when assessing future mates. "Bobby? It's not gonna work. Chuck? Forget about it. Benjamin? How you doin'?" Gold and purple gift bags! With JMU wine glasses! She's the wizard of hospitality, for sure.